Newly purchased, on the trip home, and caught fire. Gotta wonder about the Mechanic Inspection on this one. Or a new owner that did not know about the blowers. We have had 3 explosions, like this, in the last 2 weeks on Ky or Barkley lakes. No one killed, yet. A classic scenario. I have lost count of the number of incidents of this type I saw during my years in boating safety. It's always the same. Fuel up, start up, move away, blow up. It happens for various reason but generally this is the cause. During the fueling there is a loose clamp or fitting on the fuel fill or on the connection to the tank. So while fueling fuel is leaking into the engine room. Running the blower should definitely be done but it only delays the inevitable. When they start up there is such a fuel rich mixture in the air in the engine room that nothing blows, yet. As the fuel air mixture leans out due to air movement in and out of the engine room, soon you reach the exact fuel/air ratio to ignite the fumes. Something sparks and sets off the mixture and up she goes. Novices tend to skip a few essential steps when fueling. Tie up, Shut everything off. close all hatches doors, windows, and other openings. fuel making sure you are putting it into the fuel fill (yes people do put it into the wrong hole). Stop fueling. return the hose to the attendant (if there is one) wipe up any spills even the tiny drops. 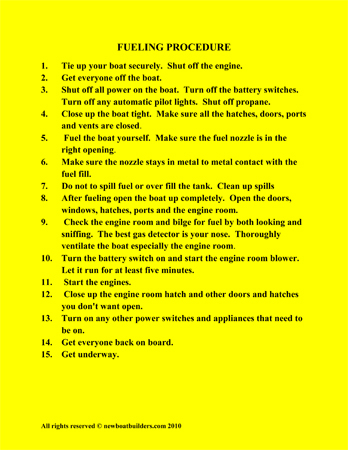 open up all hatches windows doors etc especially the engine room. Sniff around in the engine room for fumes. Your nose is still better than any gas detector. Run the blow for at least four minutes. Turn things back on that need to be on. Start engines. Close up what needs to be closed and motor away. If at any point in the process of opening up and getting underway, you smell gas, STOP. Find out why. Don't ignore it. If it turns out you have gas in the bilge call the fire dept, and move the boat by hand (not with the engines) away from the fuel dock. Last edited by Ike; 07-11-2018 at 02:28 PM. I have something to add that might sound like "Captain Obvious" to most, but is a simple thing to overlook; While prepping our SeaRay bow rider for the season, I noticed that the exhaust hose for the bilge blower had come loose and was laying on the floor. Simply put, it sounded like it was workign but was only blowing air around the engine compartment and basically useless. All boats are constructed differently, but my SeaRay is simply a flex hose with a zip tie clamp just like a clothes dryer hose. I have no idea how long it was off, to be honest. Easy fix, of course. I replaced the zip tie with a metal clamp that goes on with a screwdriver. You can bet checking it regularly is now a part of my regular routine. my 1972 Sea Ray 190 SRV had the same problem. Now everything is clamped in place.